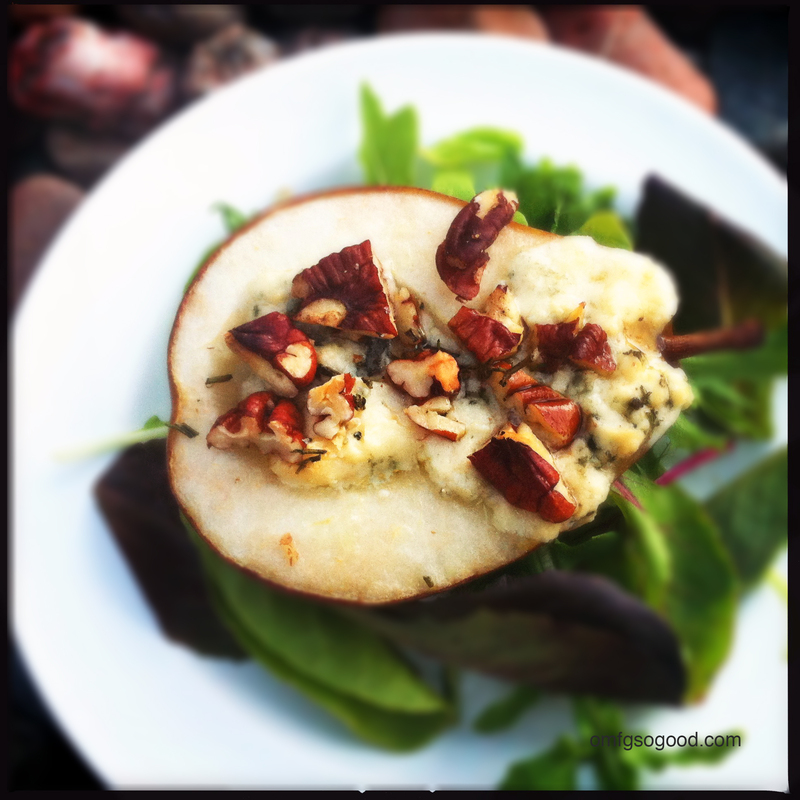 roasted pecan gorgonzola pears | omfg. so good. We have an Italian Rosemary bush in our backyard that smells incredible. Jonny has been trying to shape it like some sort of bonsai tree for over a year now. No. Not just a few sprigs of rosemary. An entire small shrub of rosemary. Sigh. Thankfully I happened to have some perfectly ripened red pears on hand, along with a little container of Gorgonzola that was just ‘stinkin’ for something to top. Preheat oven to 375 degrees. Line a sheet pan with parchment paper and set aside. Cut each pear in half, remove the core and seeds with a spoon and arrange the halves (skin down) on the prepared sheet pan. 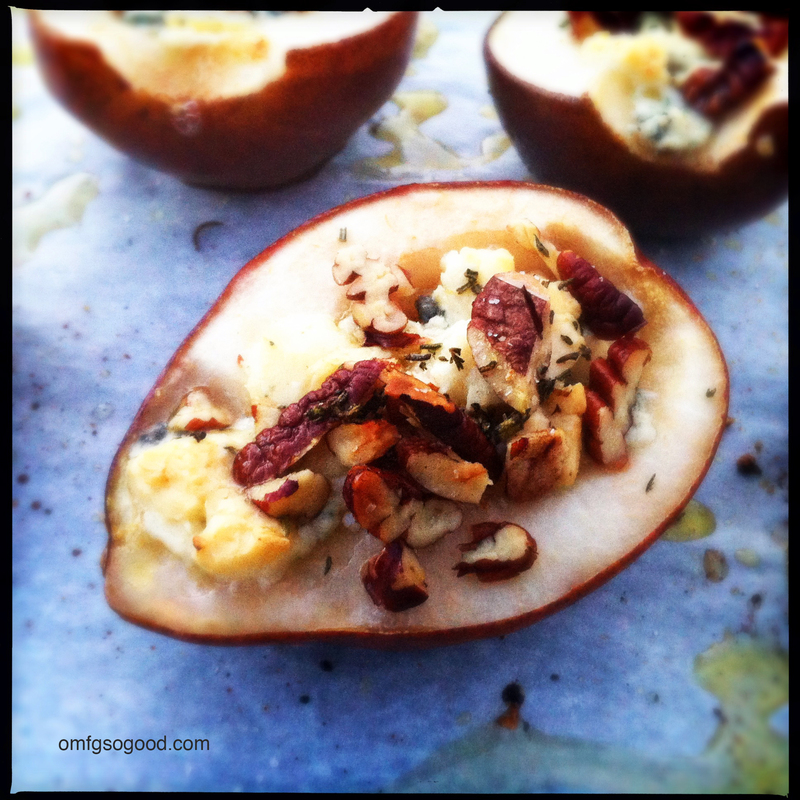 Top each pear half with a few spoonfuls of gorgonzola then sprinkle with chopped pecans and rosemary. Drizzle the tops with olive oil and sprinkle with salt. 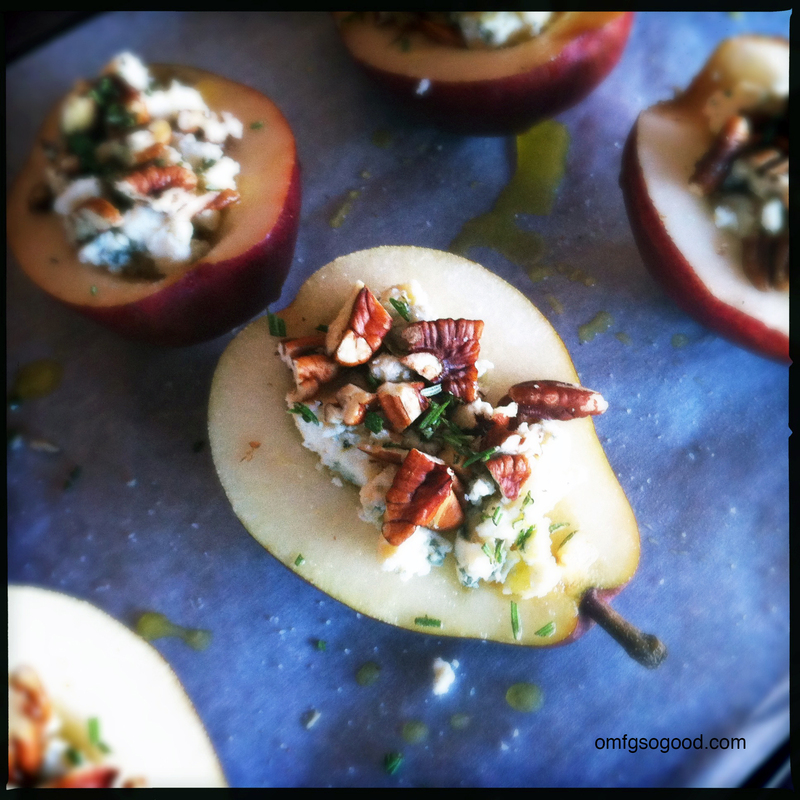 Roast in the preheated oven for 20 – 25 minutes or until the pears are fork tender and the cheese is soft and melty. These are delicious alone or served over a small bed of fresh micro-greens. The combination of tastes and textures is fantastic… sweet juiciness from the pears, creamy bite from the cheese, and earthy crunch from the pecans. So good. SO GOOD. Did I mention they were good? So good that Jonny is sitting at the counter right now eating his fourth serving. Which is also good because it’s probably best to wait until he’s settled into a pear-cheese coma before showing him what’s left of his bonsai project.